Students are the beating heart of any educational institution - and long after they graduate from a college or university, they remain an important and vital representation of that institution and all it has to offer. Today, colleges and universities may invite their graduates to showcase their degrees and certificates on their LinkedIn profiles - all with the simple click of a button. 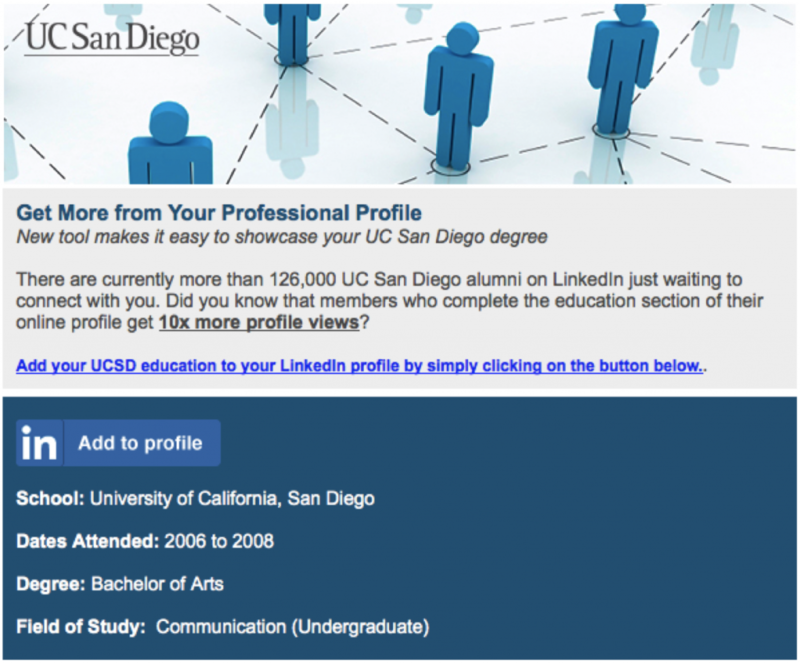 Through LinkedIn’s Add-to-Profile program, educational institutions can embed a simple link on their websites and in emails sent directly to graduates. When graduates click that “Add-to-Profile” button, they’ll have the option to add that achievement directly to the “Education” section of her LinkedIn profile by previewing it and just hitting “Save”. For students, adding a degree or certificate to their LinkedIn profiles is both smart and straightforward. People whose profiles include an education get an average of 10x the profile views of those who don’t - and more visibility frequently translates to more opportunities, from connection requests to job possibilities. With the Add-to-Profile option, they can update their profiles - without being on LinkedIn itself. For colleges, universities and certificate providers, the Add-to-Profile button is a helpful service to offer students and a low-effort way to stay connected with them over the long term. Any educational institution may now incorporate the button on its website for free and begin sending emails to students and graduates by following the easy instructions on our site. Currently, LinkedIn is working with 13 participating colleges and universities: Arizona State University; Kaplan University; University of California, San Diego; Villanova University; George Washington University; Full Sail University; University of Manchester; University of Cambridge; Universitas Indonesia; The Open University; Algonquin College; Keio University; and the University of Melbourne. The higher education sector marks the first - but not the last - expansion of our Add-to-Profile program, which originally launched last year after a successful pilot to help members add certifications to their LinkedIn profiles. And as a result of participating in the program, Microsoft’s certifications on Linkedin have nearly doubled and Coursera certificates increased 133x. We’re now working with multiple certification providers, including Pearson Acclaim, Lynda.com and Aspiring Minds. Questions? Check out the Add to Profile site.